It was only a matter of time before someone came out with a Game of Thrones slot machine. We’re sure all the major slot designers wanted to create one, but it was Microgaming that won the deal in the end. The gameplay itself is based around a standard five by three board. There are loads of different special features and the slot is consistent with the content of the original series. True to the original content. The music and stylish artwork helps create a game with a strong feeling of the TV series. Lots of different bonus features. With four different free spins modes to work through, it will be tough to see all that the Game of Thrones slot has to offer on a single visit. Feebly low upper betting limit. At just £6, we’re sure it will be more than just the highest rollers around who will find it overly limiting. The whole game feels like it’s missing something. Considering the original content is so visually stunning, some extra animation would certainly help to bring the slot version to life. 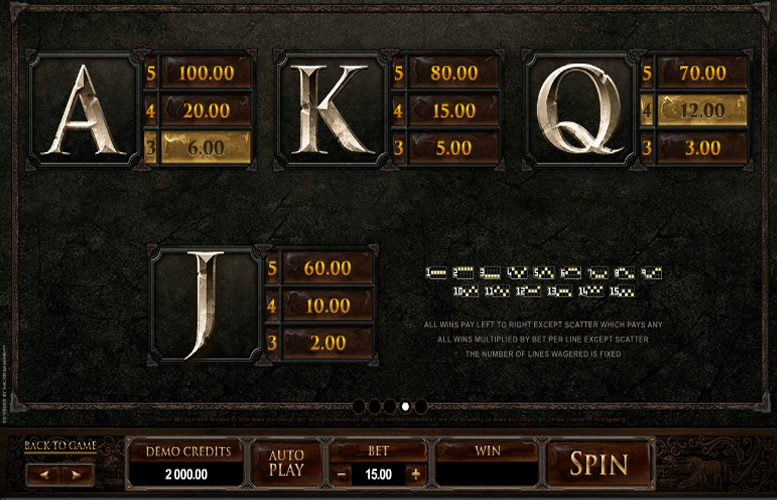 The max possible jackpot is 75,000 coins and is won via bonus features/free spins on the Game Of Thrones slot. Throne itself = 200x the total bet. Game of Thrones “wild” logo = 16.6x the total bet. House of Baratheon = 8.3x the total bet. House of Lannister = 6.6x the total bet. House of Stark = 5.8x the total bet. House of Targaryen = 5x the total bet. 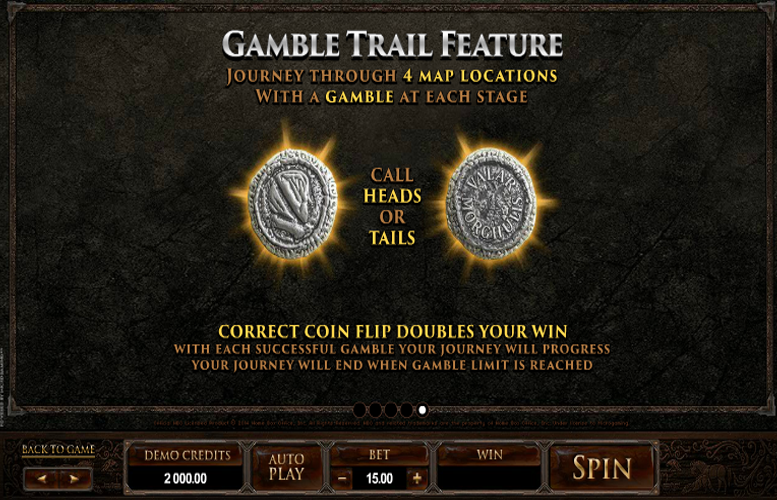 Players can journey through four different locations on the map with a gamble at each stage. They simply select the “gamble” option next to spin following any single win. They must then call either heads or tails on a coin toss. If they’re correct, they’ll double their winnings and head on to the next stage. If they fail, they will return to the main game and forfeit their stake. Without doubt, the game’s most important symbol is the throne itself. It not only awards players with the highest cash prize for hitting five-of-a-kind, it also awards random cash prizes for any two appearing in any positions on the reels. What’s more, landing three, four, or five thrones will trigger the free spins selection. Players should note that these can be retriggered. 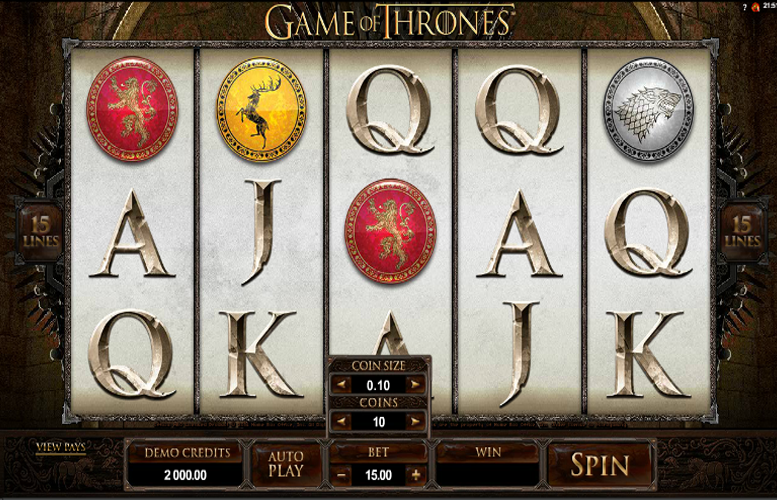 Players must pick one of the Houses from the Game of Thrones series once the free spins have been triggered. Players who select the Baratheon Free Spins will be awarded with eight free spins with a 5x multiplier. The yellow Baratheon crest will appear on the reels as a three symbols stack too. 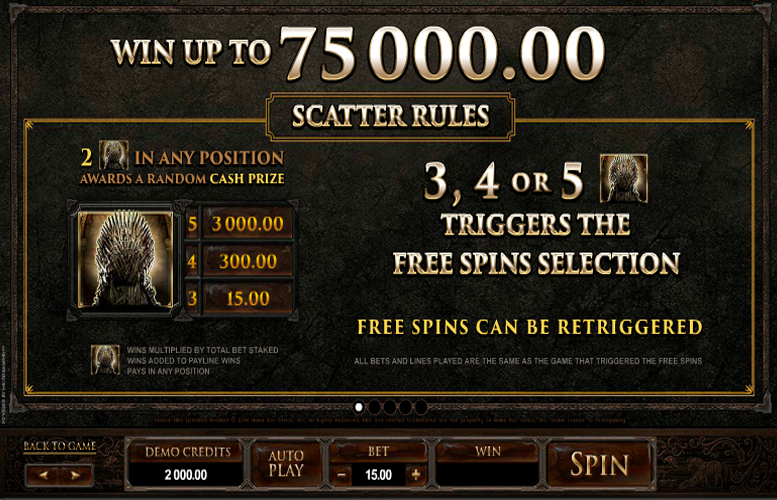 Players who select the Lannister Free Spins will be awarded with 10 free spins. These will be subject to a 4x multiplier. During these free games, all the Lannister House crest symbols will appear stacked in fours. 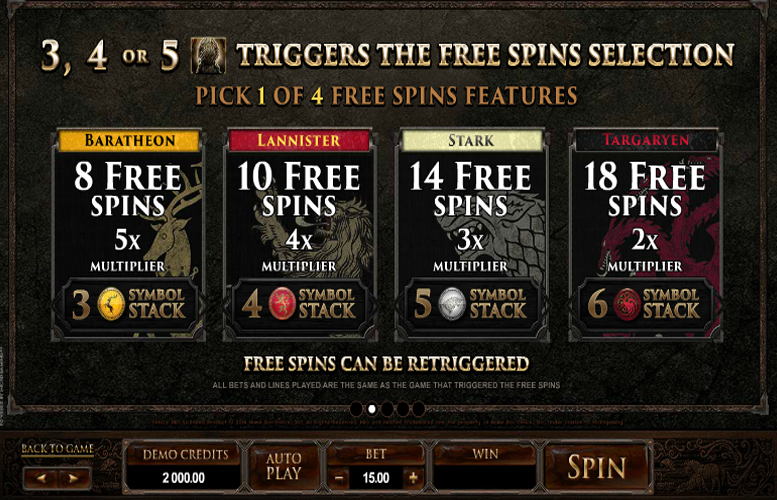 Players who select the Stark Free Spins mode will be awarded with 14 free spins. These will be subject to a 3x multiplier. In addition, the Stark House symbol will be stacked in fives on the reels during the free games. Players who opt for the Targaryen free spins will be awarded 18 free spins. These will be subject to a 2x multiplier. In addition, the red Targaryen symbol will appear stacked in blocks of sixes on the reels for the duration of the spins. All free spins modes can be retriggered. 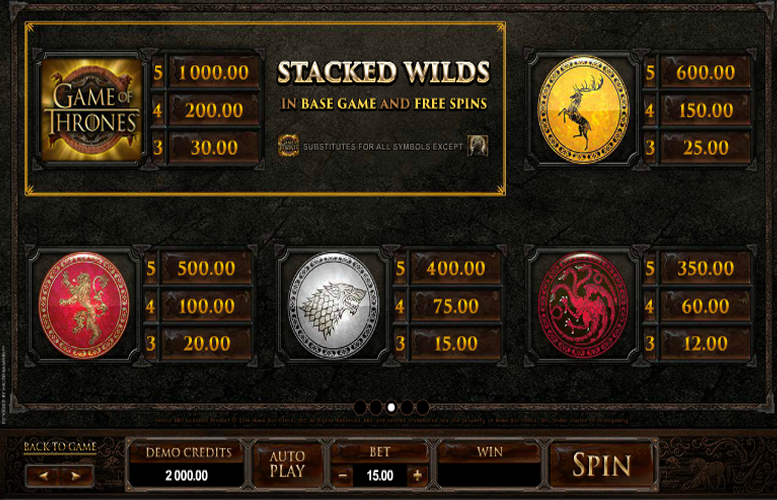 The Game of Thrones Logo is both “wild” and stacked during both the base game and the free spin mode. It will substitute for all other symbols except the “scatter” symbol. Ace or King = 2x the total bet. Queen or Jack = 1.3x the total bet. Since it’s a “ways to pay” machine, rather than one that relies on strict win lines, players are not able to adjust the number of win lines they play. They can only alter the total size of the bet. Here, the minimum is 60p and the maximum is a hugely uninspiring £6. We’re sure this will irk more than just the highest rollers around. The Game of Thrones slot machines is a solid enough title. It offers players loads of variety in terms of special features and remains true to the original series. Unfortunately, the game itself seems a little rushed and could benefit from addition animation, given that the source material is so visually stunning. In addition, the upper betting limit is tragically low. These caveats to one side, fans of the series will certainly enjoy this title. This game has a rating of 4 / 5 with 581 total reviews by the users.